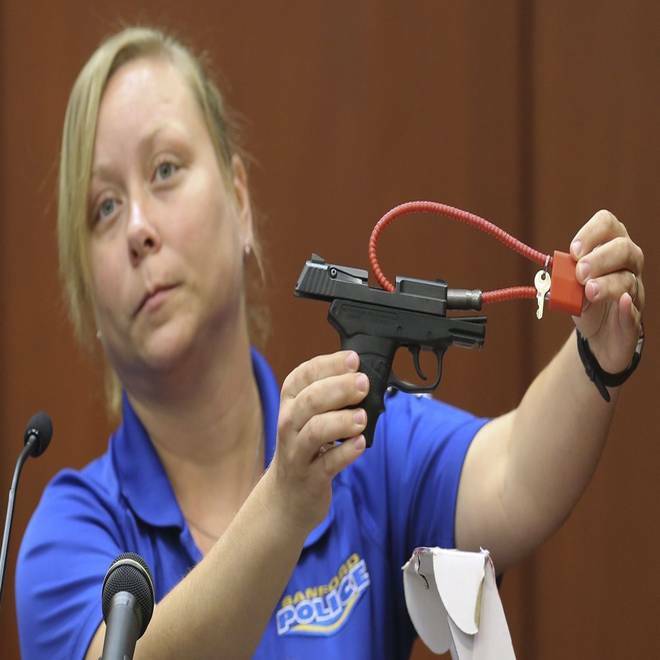 Diana Smith, crime scene technician for the Sanford Police Department, holds up George Zimmerman's gun. The U.S. Department of Justice has put a hold on returning the gun to Zimmerman because they are currently holding evidence from the trial. WASHINGTON — George Zimmerman, who was acquitted of murder by a Florida court last week, will not immediately get back the gun he used to shoot Trayvon Martin, because the U.S. Justice Department requested a hold on evidence from his trial, a law enforcement official said on Thursday. The hold is standard procedure and does not reveal whether the Justice Department plans to pursue a new prosecution of Zimmerman, 29, said the official, who would speak only on condition of anonymity. A jury in Sanford, Florida, found Zimmerman not guilty of second-degree murder on Saturday. Expectations that Zimmerman would get his 9 mm pistol back helped to fuel anger among those Americans who thought he had profiled Martin, 17, and should be punished for the teenager's death last year. Zimmerman's lawyers said he acted in self-defense during neighborhood watch duty when Martin attacked him. Federal prosecutors said they were pursuing an investigation into whether Zimmerman violated civil rights laws. Lawyers with expertise in civil rights have said they think new charges are unlikely.